offering Botox and fillers at our office! Dr. Attar is rooted in the Libertyville community. He was raised in Libertyville, Illinois, and is a graduate of Carmel High School. He was exposed to medicine at an early age with two physician parents. They inspired him to serve his community. He graduated from Tufts University School of Dental Medicine in 1997. He completed a 2 year General Practice Residency at the University of Illinois where he served as Chief Resident from 1998-1999. He continued to teach part time at the University of Illinois in the Department of Oral Medicine until 2005. He has also completed working with the Infant Welfare Society of Chicago since 2007. Currently he is an ADA member, AGD member, and part of his local Chapter Seattle Study Club. He lives in Lake Forest and is married to his sweetheart Lina, and has two beautiful girls, Alia and Rayanne. He spends his free time running and enjoys skiing. Dr. Attar is honored to have served his country since 2008 as a member of the United States Naval Reserves (USNR). His current rank is Commander 05. As a Navy Dental Officer, he is charged with responsibility for Virtual Detachment, Expeditionary Medicine Great Lakes. His duties include assisting sailors to complete their active duty training, and for facilitating their training, travel and other logistics. He has served at the Marine Corps Recruit Depot (MCRD) in San Diego, Kauai Innovative Readiness Training, and Lovell Federal Base at the Naval Station, Great Lakes. Dr. Attar has completed several field exercises including most recently Northern Lights in Northern WI. have a longstanding working relationship. 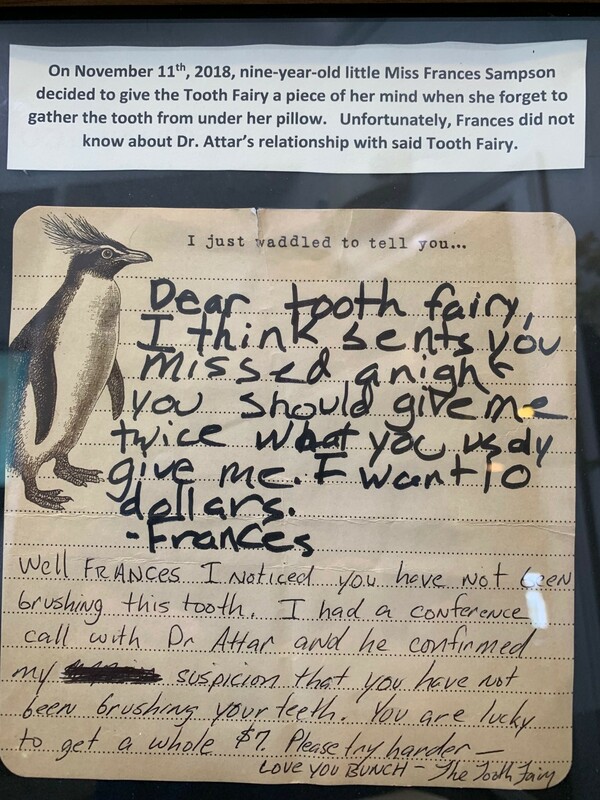 After so many years serving the community of Libertyville, Dr. Attar has naturally formed a pretty close relationship with our local Tooth Fairy. This sometimes works to the disadvantage of his youngest patients, since the Tooth Fairy always lets Dr. Attar know when someone’s lost teeth show signs that they’re skipping brushing! Dr. Attar (and the Tooth Fairy) recommend that children be taught to brush for at least two minutes, twice per day, and ensure that they’re scrubbing every tooth all the way to the gum line. Our team is happy to help teach your young children tips to keep those new teeth healthy and strong! I began working at Attar Dental in 2011, first as a Dental Assistant and later became the Office Manager. Management does not come easily, however our team has attended several seminars and worked with consultants, giving us the skill set to conquer any difficult tasks. Recalling back to high school, we were required to research different occupations for Career Day. I just so happened to choose Dental Hygiene and that has been my goal ever since. Currently I am on the waiting list to be accepted into the Hygiene program at ClC which would begin next fall. This has been a very fulfilling year for myself. I was married in August of 2017. In September we decided our home and hearts needed another fur child. We now share a bed with 2 overgrown babies. Keller is our 8 year old Golden Retriever, and Khaleesi is our 1 year old St. Bernard. Next year my husband and I will be moving into a new home that we are going to begin building this spring. I am a Registered Dental Hygienist and joined the Attar Dental team in 2013. After graduating from the College of Lake County with a degree in Dental Hygiene I knew I wanted to work for an office with the latest technology. Dr. Attar’s office was a perfect fit! I received advanced training and certification to administer local anesthetics as well as nitrous oxide sedation. In 2014, I was certified in laser dentistry. As a member of the American Dental Hygienist Association and Lake County Dental Hygiene Society, it is important to me to stay at the front of advancements in Dental Hygiene. My goal is to provide the best quality dental care available to all of my patients. Since I came on board with Attar Dental I have found a new passion for dental mission trips and helping others. We have traveled all over the world to help people in need and I feel so lucky to have found an office that loves to give back. In my free time I enjoy watching my nephew Lio, and spending time with family and friends. In the summer you can find me in a boat on a Wisconsin lake or downtown Kenosha at the Harbor Market. I joined Attar Dental in January 2014 and have been in the dental field for about 10 years now, starting as a hygiene assistant and now as a receptionist/ finance coordinator. I really enjoy helping people and bringing them the best dental care possible. I got married in the fall of 2017 to my wonderful hubby. When we aren’t at home, spending time with our 2 adorable fur children, we really enjoy traveling up north and spending time with family and friends.